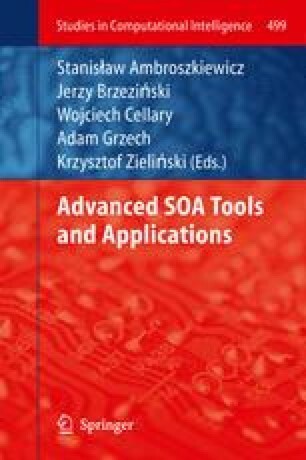 This chapter introduces a pragmatic methodology for adding and managing adaptability in multiple layers of the SOA application execution infrastructure. Adaptability mechanisms and techniques are investigated by referring to the MAPE-K pattern, which is viewed as the most representative solution for adaptive and autonomous systems. The SOA solution stack developed by IBM is selected as the basis for the application execution infrastructure model. This makes the proposed concepts easier to understand, while not detracting from their general nature. The adaptability aspect is considered in a broad context, with attempts to address, in a uniform way, all SOA applications composed of software services (Virtual Services) and hardware components (Real World Services). The proposed methology is supported by the AS3 Studio package which is a complete suite of tools providing extensions of SOA systems with adaptability features. This methodology is presented as a crucial part of the governance process of SOA applications. Finally, a case study which illustrates the proposed approach is described. This work has been performed by many contributors of IT-SOA Projects. The authors wants to thanks especially to: Paweł Bachara, Marcin Jarz a̧ b, Robert Szymacha, Dominik Radziszowski, Jacek Kosiński, Kornel Skałkowski, Przemysław Wyszkowski, Sławomir Zieliński. The research presented in this paper was partially supported by the European Union in the scope of the European Regional Development Fund program no. POIG.01.03.01-00-008/08. Smith, R.B. : Spotworld and the sun spot. In: Proceedings of the 6th International Conference on Information Processing in Sensor Networks, IPSN ’07, pp. 565–566. ACM, New York (2007). doi: 10.1145/1236360.1236442. Walsh, W.E., Tesauro, G., Kephart, J.O., Das, R.: Utility functions in autonomic systems. pp. 70–77 (2004). doi: 10.1109/ICAC.2004.1301349.